The 2016 Gimmick Rally will be held on Thursday, June 23rd, beginning and ending at Jay Peak Resort, Vermont. 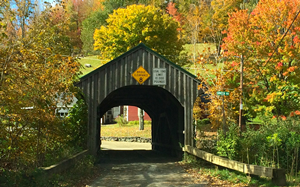 This year’s theme will highlight one of the unique New England features we all think of when we hear “Vermont” – covered bridges! The route will cover just over 100 miles and take you to more than a dozen classic covered bridges... with numerous photo opportunities. In fact, this year's rally is called the Selfie Rally, and you will need a digital camera, or cell phone camera, to record those unique photo ops along the way (we will ask for some of your best to show at the banquets). 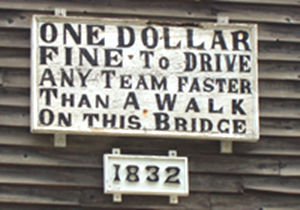 In addition to the bridges, you will be able to see (and stop at if you wish) the stunning Smuggler's Notch mountain pass and scenic byway, the charming town of Stowe, the famous Trapp Family Lodge (Sound of Music) and Brewery, and other unique Vermont attractions such as the Johnson Woolen Mill and Smuggler's Notch Distillery. Driving time without stops is about 3 hours, but you will definitely want to stop for photos, sightseeing and sustenance along the way. Plan on about 5-6 hours overall. You may use navigational devices and you should have a working odometer. The first cars will depart at 7:30am and depart one per minute thereafter until about 10:30am - you will get to choose your out-time window at registration. You can plan your day by knowing that all cars must be back by 4:30pm for scoring. This Gimmick Rally should not disappoint - you will drive some excellent Porsche roads, and see some gorgeous scenery - as well as some of the unique and historic charm of Vermont. The roads on the rally are paved, with the exception of some short stretches of hard packed dirt by some of the bridges. All sections of dirt road will be clearly marked on the directions. 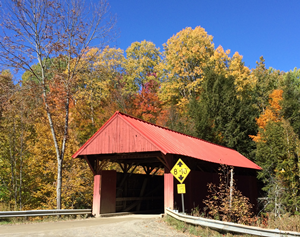 If there is dirt access, you can choose to by-pass some of the bridges, observe them from a distance or in some cases walk to them, but if you want to see covered bridges in Vermont, you will have to expect to drive on some dirt roads (and be prepared to wash your car when you return). :-) This rally route has received the Bob G. seal of approval, so I hope you will enjoy it too! Please contact me if you have any questions or concerns. The Gimmick Rallies since 2010 have been organized in a similar manner; an average driving time of 3 hours, with an eye to highlighting the local history, unique attractions, scenic drives and overall flavor of each Parade location – including suggested stops along the way for something that you might not otherwise see or experience anywhere else. The “gimmicks” have generally been suggested by something about the route and its possibilities that “inspires” the rallymaster…. and that changes every year. Just like a box of chocolates... you never know what you’re going to get! 2010 St. Charles rally followed the Lincoln Highway through Illinois using a Jeopardy-themed Q and A. Savannah’s 2011 route traveled through the unique lowcountry and southern charm of South Carolina, with an eye for the signs. 2012’s Salt Lake gimmick was all about the numbers - speed limit, caution and grade signs – adding and subtracting your way through the gorgeous mountain passes. 2103 saw Porsches going forwards or backwards around Michigan’s Mission Peninsula, passing each other every which way, with a unique selection of photos to identify along the way. 2014’s Monterey scenery was incredible – both inland and along the coast, and rallyists had the choice of driving either one of the routes, or both, for the overall trophy. 2015 in French Lick, Indiana we ran with a horseracing theme, searching for clues and finding scavenger items at the Kentucky Derby museum and scenic surrounding towns. Don’t forget, you are able to drive the Gimmick Rally in a Porsche OR any car or truck, rental, tow vehicle, etc. This event is excellent for families, and always fun for couples and friends. I hope to see you there, and if you have questions, please contact me at ebeck944@comcast.net.